This is the third in a new advanced series of posts written by Imanol Pérez, a PhD researcher in Mathematics at Oxford University and an expert guest contributor to QuantStart. 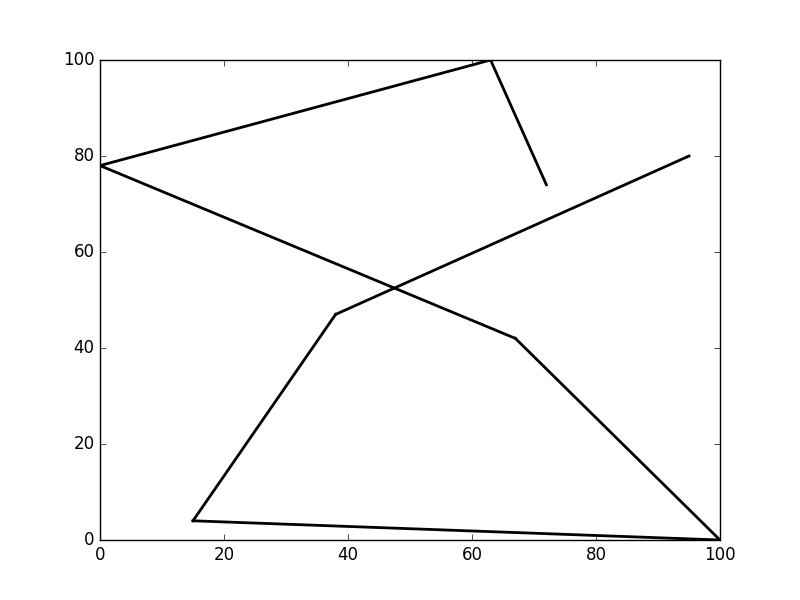 In this post Imanol applies the Theory of Rough Paths to the task of handwritten digit classification—a common task for testing the effectiveness of machine learning models. As we discussed in the last article, signatures enjoy many properties that can be exploited to create a signature-based machine learning model. In that article a Python package was created to apply this model to concrete examples. In this article, the package will be used to show the power of signatures. Handwritten digit recognition is quite a popular challenge in machine learning and is often used to test the performance of machine learning models. Thanks to its popularity there are many free databases that can be downloaded. We will first test our model using one of these databases in order to show that the signature-based model performs well. Handwritten digits can be seen as continuous paths in a straightforward way and we can therefore calculate their signature. As we will see the signature of a handwritten digit will be distinctive enough to distinguish digits from each other. where $(x_i, y_i)$ are points on the plane, with $0 \leq x_i, y_i \leq 100$, and $D$ is the digit (an integer from $0$ to $9$) that corresponds to the sample. Each sample was obtained from a writer that uses a digital pen to write on a tablet. The tablet records the coordinates of the pen at 8 different time points. The objective is to use this information to predict the digit $D$. There are 10992 samples in the database in total. The dataset is divided into a training set of 7494 samples and a testing set of 3498 samples. Using Python and the package created in the last article in particular, we will create a model that uses the dataset from the UCI repository to recognise handwritten digits. The complete code can be found in this Git repository. First we will create a simple class to store information about a digit. 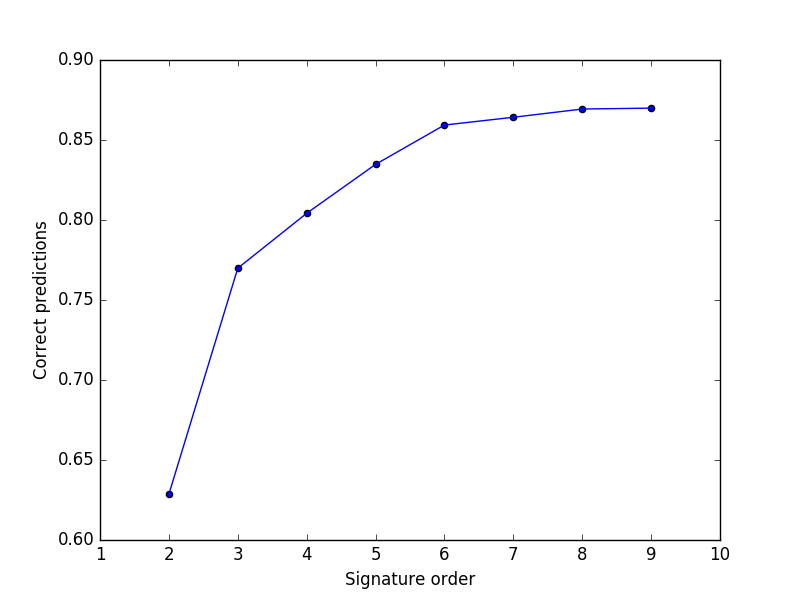 The accuracy of the model, for different signature orders, can be seen in Figure 2. The best results were obtained for the 9-th order signature, with a percentage of correct predictions of 87%. 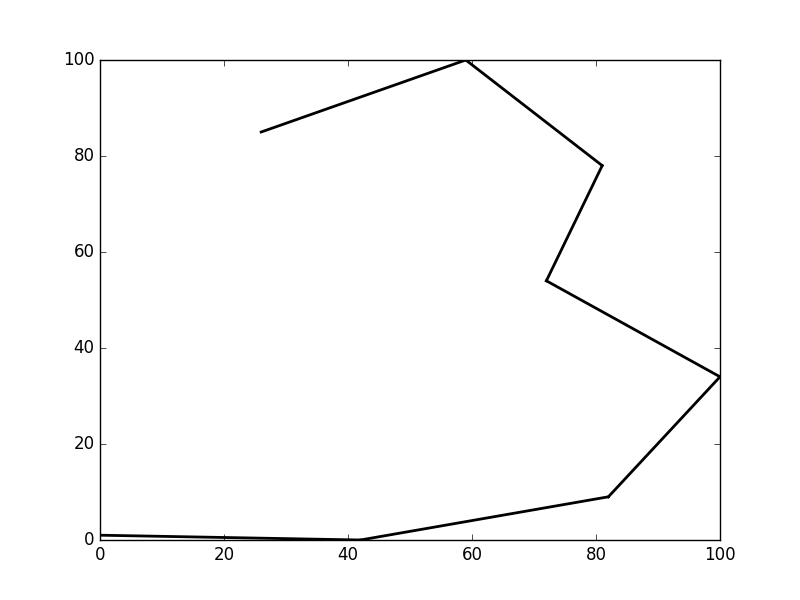 The plot also shows that the predictions were improved significantly when the order of the signature was increased. The model presented in this article is a simple approach that illustrates the effectiveness of signatures when it comes to classifying objects. Needless to say, the model can be significantly improved to obtain even better accuracy. For instance, one could rescale the digits, in order to improve performance using cross-validation. Neural networks can also improve the accuracy. In the papers by Graham and Király et al, a signature-based machine learning model was used to classify handwritten digits with very high accuracy, around 99%. A similar approach can be used to classify handwritten characters in general. In , for instance, B. Graham successfully implemented a signature-based model to recognise handwritten Chinese characters.